I believe I found an adorable teacher appreciation gift. 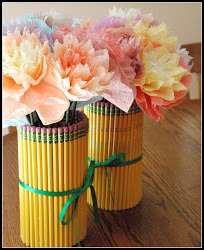 There is a feeling I get this time of year, a deep desire to smell brand new pencils. Maybe this is a universal desire because today is national #2 pencil day. There is a longing deep within my soul to fill in a bubble and take a standardized test. I have never understood what exactly would happen to you if you filled in one of those bubbles with a #1 pencil or even if there was another kind of pencil besides the beloved #2. Today, write a little note to yourself with a #2 pencil and enjoy this holiday for school supply nerds, such as myself.